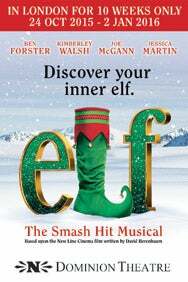 We do not curently have theatre tickets available for Elf The Musical. This could be because we have simply sold out or it could be that this show is no longer running. The information on this page remains purely for historical and informational purposes. Based on the beloved 2003 New Line Cinema hit starring Will Ferrell, Elf features songs by Tony Award nominees Matthew Sklar and Chad Beguelin (The Wedding Singer), with a book by Tony award winners Thomas Meehan (Annie, The Producers, Hairspray) and Bob Martin (The Drowsy Chaperon). The production will feature direction and choreography by Morgan Young (Chitty Chitty Bang Bang), set design and costumes by Olivier award winner Tim Goodchild, lighting design by Olivier award winner Tim Lutkin, with sound design by Clem Rawling. Elf is the hilarious tale of Buddy, a young orphan child who mistakenly crawls into Santa's bag of gifts and is transported back to the North Pole. Unaware that he is actually human, Buddy's enormous size and poor toy-making abilities cause him to face the truth. With Santa's permission, Buddy embarks on a journey to New York City to find his birth father, discover his true identity and help New York remember the true meaning of Christmas.